Granstrom Evergreens Wreaths: A 30" Wreath, 26" Wreath, 22" Wreath and our 18" Wreath. Granstrom Evergreens is a wholesale and retail supplier of fresh Christmas evergreen wreaths, swags and garlands from the Pacific Northwest. Our evergreen products are made of noble fir, cedar and juniper. We specialize in providing top quality customer service and products to our customers and we love working with fundraising groups such as public and private schools, co-operative preschools, Boy Scout Troops, Cub Scout Packs, high school sports teams and anyone else looking to hold a successful fundraiser for their organization. The Classic 22" Mixed Evergreen Wreath. Please call us (503)-666-7896 or e-mail us at Granstrom@Comcast.net to learn more about our Christmas Wreath Fundraising Program. Download A Christmas Wreath Fundraising Information Packet to get your organization enrolled in our fundraising program. Erik Granstrom introduces Granstrom Evergreens Christmas Wreaths. A short introduction to Granstrom Evergreens Christmas Wreath Fundraisers. Erik describes Granstrom Evergreens Products. Erik describes Granstrom Evergreens Christmas wreath fundraiser program. Granstrom Evergreens is a wholesale and retail supplier of fresh Christmas evergreen wreaths, swags and garlands from the Pacific Northwest. Our evergreen products are made of noble fir, cedar and juniper. Available in 18", 22", 26", 30", 42", 60" & 72" wreath sizes. Click here for a full size wreath photo. Just as welcoming and a bit less formal than a traditional round wreath. This swag is a generous gathering of noble fir, cedar, berried juniper and natural pine cones. A hand-tied, deluxe red and gold wired bow adds the finishing touch. About 24" long. Click here for a full size swag photo. Surround your home with the fragrance and beauty of fresh Evergreen Garland. Each garland is hand-tied with fresh noble fir and fragrant cedar boughs. A wonderful way to add a holiday touch to your mailbox or porch railing. Each roll is either 25 or 75 feet long and is easily cut to any length you desire. Click here for a full size garland photo. A sturdy wreath of Noble Fir, cedar and Juniper boughs. 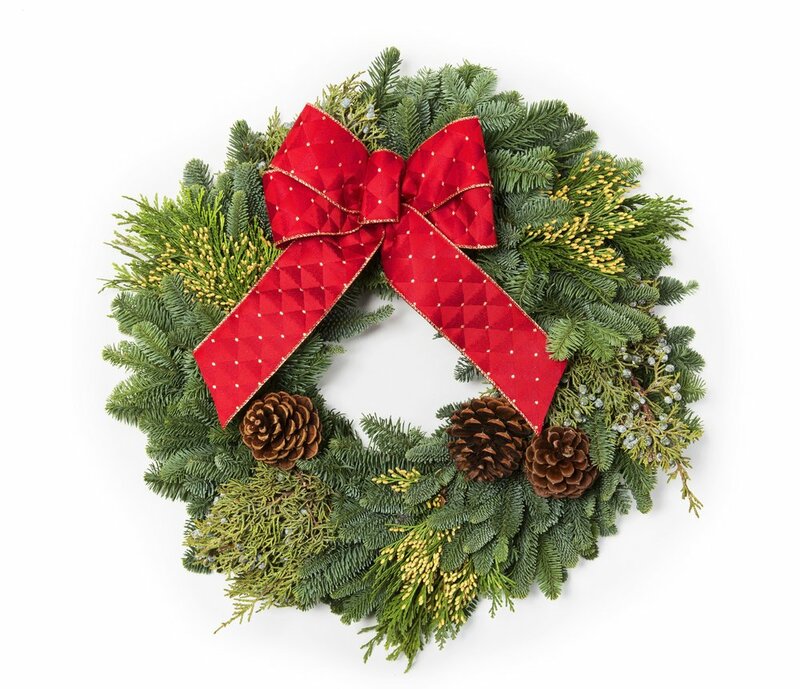 A special order item, the Mixed Evergreen Cross Wreath is the same price as our 22" Mixed Evergreen Wreath. The Granstrom Farm in 2015. Our original Granstrom Evergreens logo from 1985. Brothers Erik & Lars Granstrom in 1988. Brothers Erik & Lars Granstrom in 2007. Frank started growing and harvesting Christmas trees back in the 1970's in Oregon and selling them at his tree lot on 44th and Hawthorne in Portland. The business grew through the 1980's to included Christmas Wreaths, Swags and Garlands for the Christmas Tree customers. Through the 1990's and 2000's Granstrom Evergreens gradually transitioned into a full scale Christmas Wreath company that provides it's customers with great fundraising opportunities. In 2006 Granstrom Evergreens, L.L.C. was officially formed with Frank Granstrom and his two sons, Erik and Lars as members. Frank in his wreath delivery outfit, 2008. Growing up around the wreath business helped to prepare Erik for his eventual role as the office manager of Granstrom Evergreens, L.L.C. Erik manages the production of the wreaths as well as coordinating with all of the various fundraising customers to ensure all our customers hold a successful wreath fundraiser. Erik and his wife Amanda also make tie dye clothing which they sell on their websites, Made By Hippies and Made By Hippies Tie Dyes. Erik Granstrom, Age 10, 1989. Erik Granstrom, Age 35, 2014. Erik Granstrom, Age 38 and Jasper Granstrom, Age Four Months Old, 2017. The younger of the Granstrom Brothers, Lars oversees and manages the Noble Fir bough harvest each season. Coordinating with the U.S. Forest Service, a twelve man work crew and helicopters to air lift the noble fir boughs from the mountain and then hauling them back to the farm in Troutdale. He also operates a retail and wholesale nursery specializing in Emerald Green Arborvitae and keeps all the farm trucks and tractors in tip top shape. Lars Granstrom is out standing in his field of Emerald Green Arborvitae with Smokey the dog, 2014. Lars Granstrom packing up a wreath, 2012.